Fulfilment is when you see your former sponsored student, thriving in his career! 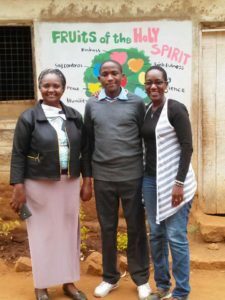 The young man on this photo (Athanus, now a teacher), was among my very first sponsored kids at Matetani Primary School. Recently when I visited his school, he recognized me and told me how my story from 10 years ago had shaped his life. He now works for his former school principal and shares the same words of inspiration with his students, telling them my story from so many years ago. He remembers people like Karin Borzel, Jana Wu, Cliff Boren, Mary Quinn, Matthew Quinn & Kathy Huff, who came with me from the United States to spend Thanksgiving in Matetani village in Kenya. Friends, your presence, your gifts and words of encouragement continue to bear good fruits. A timely word can really change someone’s life forever.